Moving on- It’s Graduation Time! 1. Prepare your base card and cut out your cap based on the shape provided above. Using a pencil, draw the lines on the white side of your blue paper stock. These lines will act as your folding lines. 2. Using embroidery string, cut 8 strands of string that are 8cm in length. This will be your tassel for your grad cap. Punch out 1 3/4″ circle using adhesive paper. 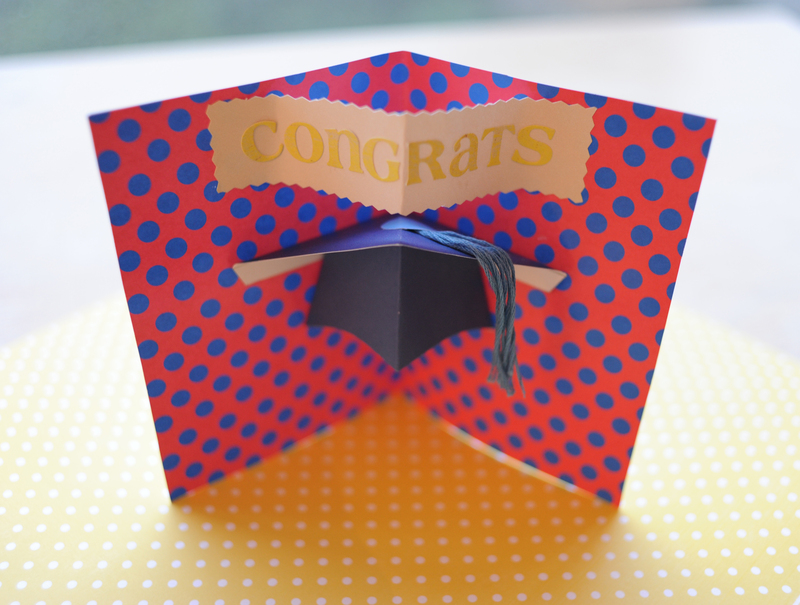 This will hold your tassel to the card. 3. 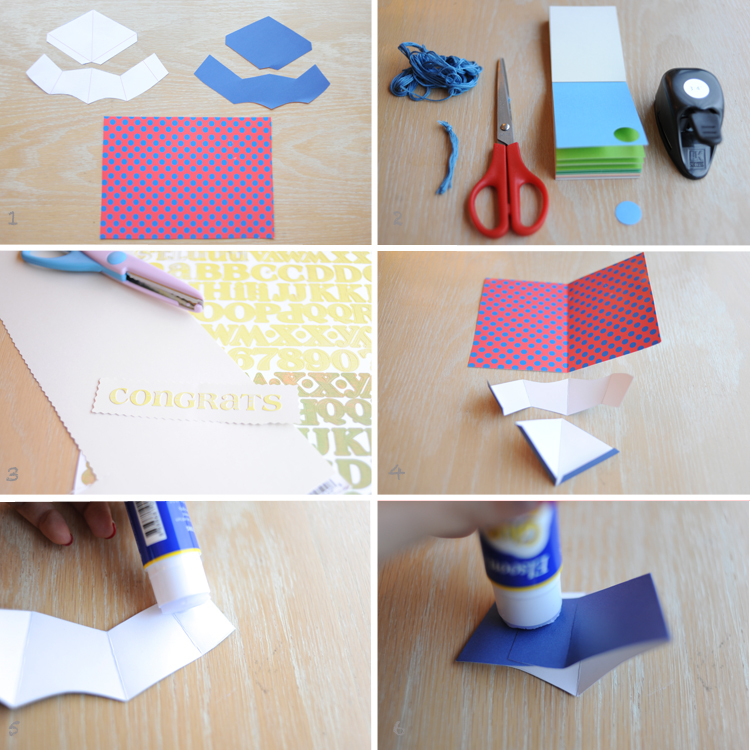 Stick the adhesive letters “C.O.N.G.R.A.T.S” onto a strip of scrap-book paper that measures 14cm in length. Using your waved-edge scissors, cut around the strip of paper to give a more fun look. 4. Now you’re ready to begin the card making process. Fold your card stock in half (mine measures 5.5″ x 8″ (l).) Take your cap sections and fold along the lines that you’ve created. 5. You want to glue the base of the cap section together first. So using your glue stick, tab glue along the smallest edge of the template to seal the piece together. 6. Then put glue on top of the sealed edge. 1. On the right side of the car, make sure that the tip of the triangle does not exceed the top of the card. The bottom left tip of the triangle should align against the center line of the card. 2. Using your glue stick, glue the bottom tab of the triangle to your right side of your card. 3. Take the base section (the other piece of your cap) and place the sticky top that you glued to the based of the card. Make sure the base of your sticky section is aligned with the center line of the card. 4. On the left side of the card, you need to glue the tab of the other base of the triangle to the paper. 5. Same thing with the base section of the cap. Glue the other half to the left section of the card as seen in photo 5. 6. 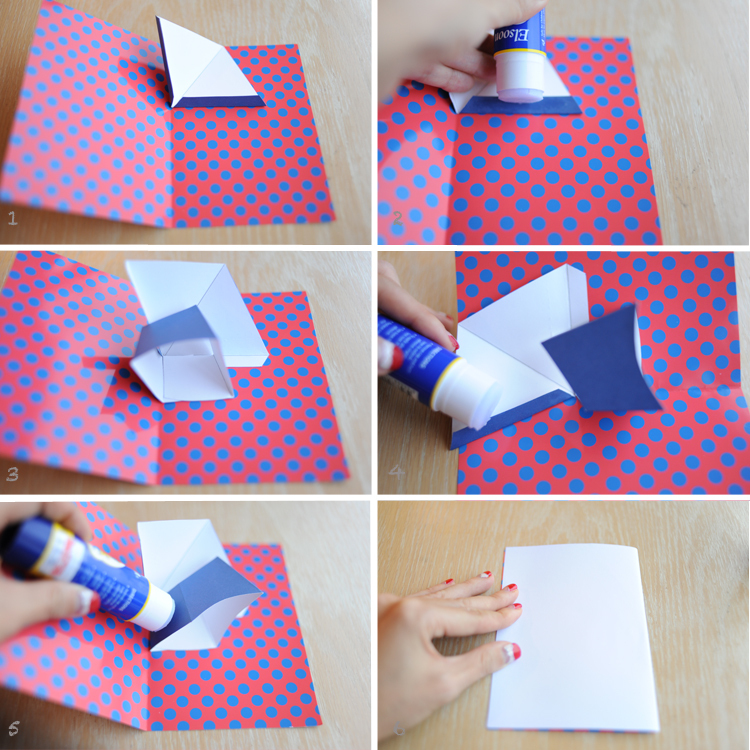 Fold the entire card over and leave to dry for 10 minutes. Last thing is to tape the tassel to the top of your hat and Voila you’re done! Tags: diy, graduation card, graduation gift, graduation season. Bookmark the permalink.